Since my recipe overhaul, I have not made a repeat complimentary dessert for nightly turn down service. I'm keeping my vow to myself to make something new and special to our in-house guests. It's all good so far and I'm happy with my achievement. Chocolate work is something I take pleasure in doing so this week, I decided to continue working with this nature's wonder. What are chocolate truffles? They are bite-sized confectioneries made with chocolate and cream. Place the chocolate in an aluminum bowl or heat proof bowl. Place the whipping cream in a saucepan. Bring to a simmer. Pour the heated whipping cream over the chocolate and add the flavoring.Allow to stand for a few minutes for the chocolate to melt. Stir until smooth. Allow to cool then chill for a couple hours. 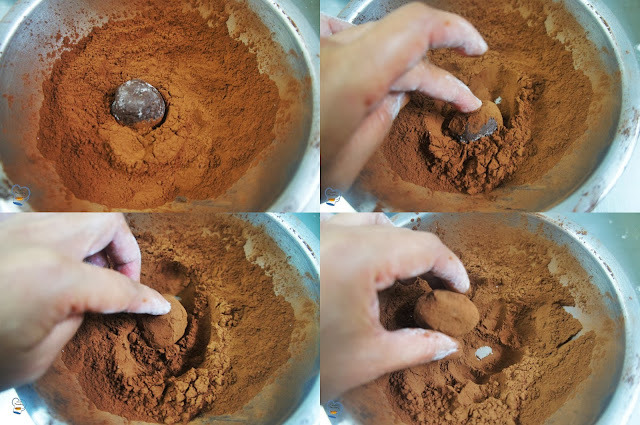 Using a spoon, take some mixture and roll balls in your hands. Roll in cocoa powder, sifted icing sugar or jimmies. Place the candy on a muffin liner and back to the fridge until serving. Enjoy this rich and decadent chocolate candy!